More than three years have passed since Egypt, Ethiopia and Sudan signed the Khartoum Declaration — the Declaration of Principles on the Grand Ethiopian Renaissance Dam (GERD) — in March 2015, yet there has been little progress in resolving differences among the three countries. Among the most difficult issues yet to be resolved the timetable for filling the dam’s reservoir, and protocols for operating GERD, have proved the thorniest. The arrival of new Ethiopian Prime Minister, Abiy Ahmed, to power in April this year offered some grounds for optimism, says Mohamed Hegazi, a former assistant to Egypt’s foreign minister. Ahmed visited Egypt in June, meeting with President Abdel-Fattah Al-Sisi, a move that Hegazi saw at the time as “implanting the seeds of understanding” and setting“the trainon the right track”. “We expected this political meeting at the highest level to push forward towards a genuine agreement. The year is coming to an end without any agreement being reached.” Rakha Hassan, a member of the Council for Foreign Affairs, agrees. “We saw a number of meetings held throughout the year but unfortunately the facts on the ground have not changed,” he says. 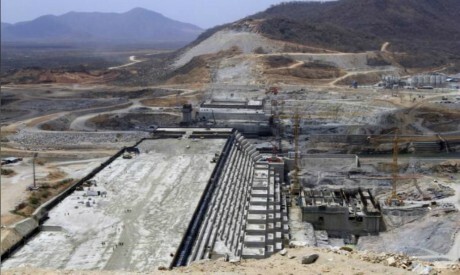 Ethiopia could theoretically fill the reservoir to full capacity in three years. Cairo wants a more extended timetable of up to 10 to 12 years. There were a number of attempts over the last 12 months to bridge the differences between Cairo and Addis Ababa. In January, Ethiopia’s then prime minister, Hailemariam Desalegn, rejected Cairo’s suggestion that the World Bank become a party to negotiations concerning the dam. Addis Ababa’s refusal followed Desalegn’s three-day visit to Egypt during which several cooperation agreements were signed. The visit had been expected to ease tensions between the two states but in fact placed further obstaclesin the path of any agreement. Sudan backed Addis Ababa’s decision. Shortly after Desalegn’s visit President Al-Sisi, Desalegn and Sudan’s President Omar Al-Bashir met on the margins of the African Union (AU) summit and agreed to resume tripartite negotiations but Desalegn’s resignation in February postponed the resumption of talks until April, when Ahmed was appointed. When Ahmed took office there were hopes that a breakthrough was imminent, especially after he managed to end the cold war with neighbouring Eritrea. Ahmed’s arrival could have helped ease the situation, says Hassan. The first nine-party meeting,attended by the foreign and irrigation ministers as well as the heads of intelligence of Egypt, Sudan and Ethiopia, was held soon after Ahmed came to power but concluded without producing any tangible outcomes regarding the filling of the reservoir or the operation of the dam. A second nine-party meeting was held in May. It was more positive, says Hegazi, since it established a mechanism for dialogue on three levels, political, technical and strategic, “although obstacles remained before reaching any agreement on pending issues”. The meeting resulted in the setting up of a National Independent Scientific Research Study Group todiscuss ways to enhance the level of cooperation between the three countries through— in the words of the document released following the meeting — addressing “equitable and reasonable utilisation of shared water resources while taking all appropriate measures to prevent any significant harm being caused”. The group comprises 15 members, five from each country.It has held several meetings.In the most recent Ethiopia proposed that the timetable for filling the reservoir be flexible, allowing for changes according to the annual study according to the level of floods and rainfall each year. The proposal was, however, rejected by the technical committee formed to review alternatives, largely because Ethiopia had displayed no commitment to implementing earlier agreements, including the Declaration of Principles. In June Ahmed visited Egypt and reassured President Al-Sisi that Ethiopia was seeking only topromoteits own development without harming the Egyptian people. “Egypt’s share of Nile water will be maintained... and even increased,” Ahmed told a news conference in Cairo after talks with President Al-Sisi. In return, Al-Sisi underlined Egypt’s willingness to promote investment in Ethiopia. In August Foreign Minister Sameh Shoukri and Intelligence Chief Abbas Kamel visited Addis Ababa to meet Ahmed and delivered a message from President Al-Sisi urging bilateral relations to be enhanced, andto push ahead with decisions made on the dam. The scientific group briefed the irrigation ministers of the three countries on the latest recommendations on the suggested timeframe to fill the dam’s reservoir in a meeting held in Addis Ababa in September. No concrete recommendations emerged from the meeting. “It was yet another meeting that ended with optimistic statements and an expression of the will to cooperate but no tangible results,” said one diplomat. Minister of Water Resources and Irrigation Mohamed Abdel-Ati announced the three countries had reiterated their commitment to continuing talks in order to reach a satisfactory agreement on the timing and method of filling the dam as per the Declaration of Principles. “We are looking for the best possible scenario to fill the Renaissance Dam, one that will not negatively impact downstream countries,” he said. Abdel-Ati’s Ethiopian counterpart, Seleshi Bekele, stressed that negotiations on filling the reservoir, based on the Declaration of Principles, remained essential. Khedr Mohamed, Sudan’sminister of irrigation and water resources, meanwhile stated that the construction of the dam represents a new era of cooperation in the Nile Basin. Egypt insists it has a historic legal right to 55.5 billion cubic metres of Nile water per annum, fixed under the 1929 and 1959 agreements that also guaranteed Sudan a total of 18.5 billion cubic metres. The agreements also give Egypt a veto onany projects to be built upstream. In 2011 Ethiopia took the decision to build a dam on the Blue Nile, the tributary which supplies Egypt with the lion’s share of its annual quota of Nile water, without consulting Cairo. Cairo fears the dam will reduce Egypt’s share of Nile water. Addis Ababa says it will not. Negotiations between the two came to a halt following the 30 June Revolution in 2013. They resumed a year later, with the election of President Al-Sisi. In September 2014 the water ministers of Sudan, Ethiopia and Egypt signed an agreement to form a tripartite technical committee to hold regular meetings to study the dam and oversee the work of the consultancy firms employed to assess its impacts. In March 2015, the heads of state of the three countries signed the Declaration of Principles.Ethiopia committed to undertake independent studies of the project’s impact, fill timeline and operation of the dam. The tripartite committee opted to hire two French consultancy companies — BRL and Artelia— in September 2016 to study the possible impacts of the dam on Egypt and Sudan. Numerous meetings have followed but no agreement hasbeen reached. In November 2017, with more than 60 per cent of the dam completed, talks broke down when the three countries failed to agree on the preliminary reports produced by the consultancy companies. Construction of the dam was scheduledto be complete by mid-2017 but that date has been pushed back because of technical problems and corruption in the building process. In July, the chief engineer died under mysterious circumstances. Another suspicious death occurred in May when an executive from the Nigerian company supplying the dam’s cement was killed while visiting a restive region of Ethiopia. Economic problems have also hampered construction, as Ethiopia found itself unable to pay suppliers. Ahmed has expressed concern over the delay. “It is a project that was supposed to be completed within five years, but seven years later not a single turbine is operational,” he told the media during a news conference in Addis Ababa in September. The delayshave been widely seen asgiving Egypt more time for negotiations, and to implement more efficient domestic water conservation plans.